Carleton University business graduates are achieving professional success and making a real difference in their communities. 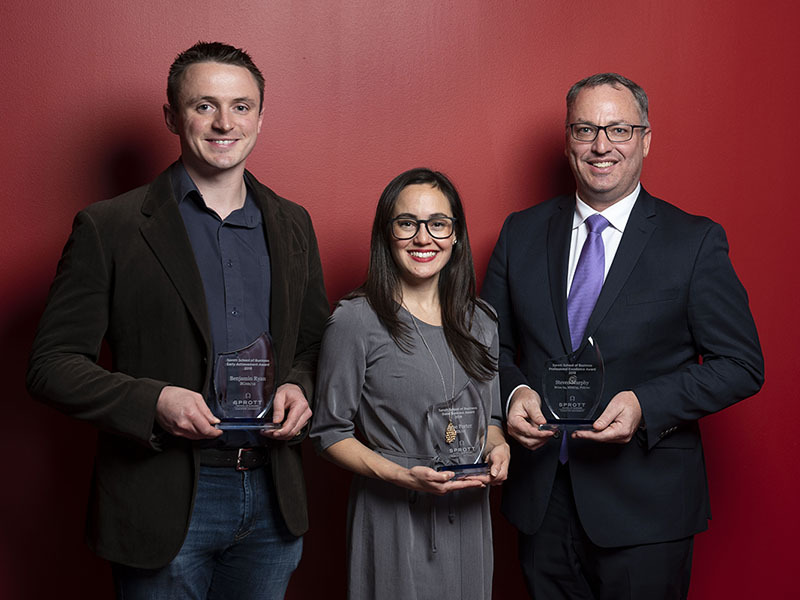 On November 26, the Sprott School of Business honoured three alumni as the inaugural recipients of the Sprott School of Business Alumni Awards. The Early Achievement Award honours a Carleton graduate of the Bachelor of Commerce or Bachelor of International Business within the last 15 years and who has achieved significant professional accomplishments since graduation. When Benjamin (Ben) Ryan was completing his Commerce degree at Sprott, he developed a passion for finance and joined the Sprott Student Investment Fund. After graduation, he went on to complete a Master’s degree in financial economics at the University of Oxford. Originally from Whitehorse, Yukon, Ben returned home with a desire to contribute to the community. Working as Chief Operating Officer for Yukon’s airline Air North, Ben saw an opportunity to create a local, economical and sustainable fuel supply to the North and to work with the First Nation Development Corporations in the region. Chieftain Energy LP was created in 2014 and Ben serves as its President and CEO. The Good Business Award recognizes a Carleton graduate of a business degree program who has made a positive impact in the local, regional or global communities through their professional, voluntary or philanthropic endeavours. In her role with Stratos, a sustainable management consulting firm, Jane works with business, governments and organizations in the natural resources sector and helps them to recognize and act on environment, social and economic risks and opportunities. After graduating from the Bachelor of International Business program in 2007, Jane went to the Univesity of Jyvaskyla in Finland to complete a master’s in corporate environmental management. While in Finland, Jane learned of the global network of Impact Hubs. Upon her return to Ottawa, Jane helped to co-found Impact Hub Ottawa, a collaborative workspace and community for social innovators who collectively want to make a positive impact. Most recently, Jane co-founded the Future of Good Summit, a two-day event that explores how to do good well in the 21st century. The Professional Excellence Award honours a Sprott graduate of a master’s or PhD degree in business who has demonstrated outstanding achievement in their career or community service. In March of this year, Steven Murphy was appointed President and Vice-Chancellor of the University of Ontario Institute of Technology (UOIT). In this role, Steven is on a mission to reinvent post-secondary education for the 21st century. He is a strong advocate for innovation and entrepreneurship. Throughout his career, Steven has been a champion for diversity, equality and inclusion. Prior to his presidency at UOIT, Steven was Dean of the Ted Rogers School of Management at Ryerson University where he led the institution in transforming its brand nationally and internationally. He also established innovative interdisciplinary programs, linking business to science, engineering, arts and design. Steven began his academic career at Carleton’s Sprott School of Business and later served as Associate Dean of Graduate Programs and Associate Dean of Research and External. Steven is a three-time Sprott graduate holding a Bachelor of Commerce, Master of Management Science and PhD in Management.